From Australia we were sent a 40′ container of Gardner engines for restoration. It included 5L2, 2LW, 4LW, 5LW and 8LXB. Amongst the items was a 1957 Dennis fire tender – all the way from New South Wales! 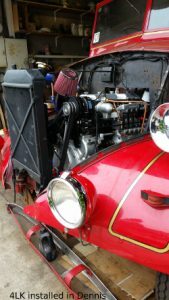 It was powered by its original Dennis four cylinder petrol engine (with two spark plugs per cylinder!). It also had a very old fashioned crash gearbox. Our job was to replace the petrol engine with a Gardner 4LK and fit an automatic gearbox! 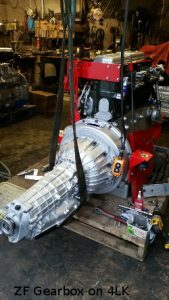 After much research on gearboxes we settled for a ZF 061, originally used in a Range Rover. Like many automatic gearboxes the ZF needs an effective oil cooler, especially in Australia where ambient temperatures can be 40C. For the cooler we plugged for Gardner of course and used a finn type from an ERF truck. Heat is dissipated from this using three large electric fans. As the total current drawn is 21A, we employed a modern 90A alternator, belt driven from the crankshaft pulley. 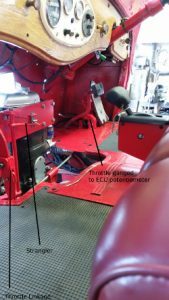 As far as we know neither the ZF nor the 4LK has ever been used to power a Dennis. Unsure how that combination would behave on the road, the ZF was supplied with an ECU (Engine Control Unit). This is programmable from within the vehicle, so we were able to dictate under what circumstances the ZF would change gear. The shifter has the normal P, R, N, D, 1, 2, 3 configuration. According to our customer, all the experts in Australia said it couldn’t be done! Many thanks to Dave Ashcroft of Ashcroft Transmissions for his help with this project.